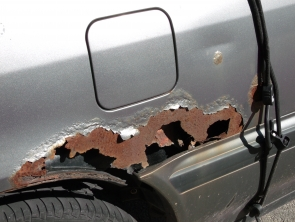 As a car owner, it is natural to become concerned when you see rust developing on your vehicle. 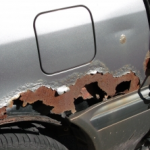 Not only is rust unsightly, but it also decreases the car’s value and the life of the car. To make matters worse, if the rust is not stopped in time it will continue to spread. The good news, is that there are rust prevention techniques to stop it from spreading and to keep your car in excellent shape. Rust can quickly form on any areas of the car where bare metal is exposed. The most common places are where the paint has been nicked, scratched, or chipped off. These small areas can turn into big problems, if not corrected in a timely manner. Other areas are a little more inconspicuous, such as under the body of the car, below the paint surface, and in between the car body and any trim or moldings attached to it. Careful inspection of these areas will enable you to catch the rust in time and stop it in its tracks. If you have noticed rust on your vehicle, the first step is to remove it. For small areas, you can use a fine-grade sandpaper or a single-edged razor blade to scrape away the rust. For larger areas, you will need to use more abrasive sandpaper. The grit of the paper will be based off the level of rust affecting your vehicle. Use the sandpaper to cut through the rust until all of it has been removed. By using the sandpaper you will also cut through the paint, exposing the bare metal. Even though it may not be visible to the naked eye, there could still be some rust lingering on the surface. To eliminate the risk of it spreading, coat the area with rust arrestor. This formula chemically transforms rust, preventing it from further oxidizing the metal, which in turn stops the rust from spreading. Once the entire area has dried, it is time refinish it. Apply primer, then paint the area with a matching color, and finish it off with a clear coat. If done correctly, your car will look and feel good as new. Best of all, you will have successfully stopped the rust from spreading. There are many areas on your vehicle that are prone to rusting, but difficult to access. The inside of frame rails and rocker panels are good examples. For these areas, the best and most simple option is to apply a good rust-preventive coating. This coating seals the surface, protecting it from air, moisture, and salt which can all lead to corrosion. The coating also prevents and stops rust from spreading. The best way to defend your car against rust, is to rustproof it. This will need to be done by a professional, but the results are well worth the time and cost. By applying a specially formulated lubricant and self-healing rust inhibitor, the professionals will rustproof your car’s engine parts, body panel undersides, frame, underside of the car, and electrical components. This rust proofing will not only prevent rust from forming, it will also prevent it from spreading. With proper rust removal, maintenance, and rust proofing, both you and your car will greatly benefit. Your vehicle will be safer, have a higher resale value, and a longer life. You will also save costs on repairs, and will benefit from having a better looking vehicle to drive. Inspect your vehicle today, and take control of the rust before it takes control of you.